London’s O2 Arena played host to Andrew Reynolds yearly Bootcamp for Entrepreneurs recently – and broke several records. 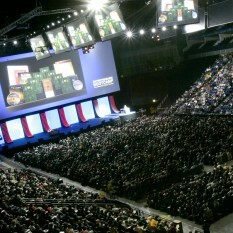 The Bootcamp was the largest seminar ever held at the O2 Arena – which is more used to Music and Entertainment concerts and events. Andrew Reynolds said “We chose the O2 Arena as it offers a uniquely comfortable venue which somehow seems intimate despite its obvious size. The acoustics and the brilliantly planned shape of the Arena mean that everyone in the room gets a great audio visual experience”. The Entrepreneurs Bootcamp event broke another record – on the technical side. The stage set included a massive High Definition projection screen – which turned out to be a record breaker – the largest indoor screen in the entire UK! Boasting a screen size of almost 35 metres by over 12 metres, the huge panoramic display, which stretched the full width of the O2 and had to be purpose built on site, due to its size – was used to great effect with a huge HD projection system displaying a number of very moving emotional pieces of film that Bootcamp founder Andrew Reynolds had commissioned just for the event. “Entrepreneurs Bootcamp is all about making money for the chosen charity – this year the Make A Wish Foundation – and also about showing people how to dramatically change their lives through becoming entrepreneurs” said Andrew Reynolds “The Bootcamp broke the record and became the largest single financial donation ever received by Make A Wish in the UK. This year we raised over £702,000 which is already being put to good use by the Children’s Charity. Finally, the Entrepreneurs Bootcamp at the O2 Arena broke the record for the largest Bootcamp ever held so far – with over 7,500 attendees taking part in the 2 day event.